Collection of Croatian Local Flags at the FAME. Zeljko Heimer , from the FAME. On 16 March 1996 the county of Zagreb adopted a new flag, at least it was today printed in newspapers, and shown on TV news. The flag is barry of 5 green and white (i.e. green-white-green-white-green), with the coat of arms of the county (also adopted today) in the middle. The coat of arms is "military shaped" (that's what they told on TV, I think it is of German type) quatered with a yellow escutcheon with rock brown from wich there is a source of water falling in a well made of stones. The first field is blue with yellow crowned lion's (panther's) head. Second is checquy red and white. Third in blue black marten passant on a green ground. Fourth barry of 5 green and white. This coat of arms is said to be based on the old coat of arms of the county of Zagreb from the 18th century (I don't know what it was, so I don't know how much it is similar [added latter: a very similar design is found on 18th century flag of County of Zagreb, that is preserved in the Croatian Historical Museum]). It is easily recognized that three of the four fields represent the three main Croatian regions, that is, the kingdoms of Croatia, Dalmatia and Slavonia. The coats here are not represented in full, but are modified a bit - there is just one head in the Dalmatian part, and there are no rivers and star in Slavonia. The fourth is said to be a coat of arms of Turopolje, a region south of Zagreb (and was used as a base for the flag). The escutcheon is explained on TV, as to represent a source that was once in the Zagreb's midpoint - called Mandusevac, and with which the legend of naming the city is connected. There is still a fountain in the Zagreb's main square in this place. One should differenciate the county of Zagreb (Zagrebacka zupanija) with the city of Zagreb. The first is including the second, and moreover several smaller twons in the surroundings. (to confuse things further, there was a County of City of Zagreb (Zupanija Grad Zagreb) that was merged with the Couty of Zagreb). I have bought a book: Csa'ki, Imre: A magyar kira'lysa'g va'rmegy�inek ci'merei a XVIII-XIX. sza'zadban, Corvina, Budapest, 1995 , in which are shown (one big coat of arms in each page!) all the coats of arms of the counties of the Hungarian part of the Austro-Hungarian Empire in the XVIII. and XIX. centuries. According to that book, the coat of arms of the former Hungarian "Za'gra'b va'rmegye" [county of Zagreb] is so described: cartouche shield, quartered: 1- azure a crowned lion face or; 2- chequered of 25 argent and gules; 3- azure a champagne vert on which is running a marten natural surmounted by a six-pointed star or; 4- vert two wavy fesses argent. On the whole an inescutcheon or a rock natural from which water is flowing to a basin. The shield is surmounted by a royal crown or. This coat of arms was adopted first in 1759. If you compare it to what is used today, it seems that the policy of readopting the COAs of the counties, if possible, is really working. They are maybe more stilized to current artistic style, but that is no wander with COAs. Regarding this particular one, my image differs in some colours, but it may be worng. I have received an image of the flag and COA of the County of Zagreb recently, and today I received also a copy of the local official gazette with the decision on those. To remind you, the County of Zagreb (Zagrebacka zupanija) includes the City of Zagreb with special status and surrounding communities and cities. The flag and COA are quite rare used, to my knowlage - only on and in the seat of the County, and possibly on the seats of its subdivisions. The coat-of-arms of the County of Zagreb is the basic shape of the historical coat-of-arms of the former County of Zagreb from AD. 1757. The shield is quartered with an escutcheon: 1. Azure, crowned leopard's head Or; 2. chequed in 25 Gules and Argent; 3. Azure, on base Vert a passant marten proper and above it a mullet of six Or; 4. Vert, two bars Argent. Escutcheon: military shaped shield (same as the main shield), from sinister a rock proper issuing water falling into a quadratic well. The flag of the County of Zagreb is rectangualr with sides ratio 2:1, hoist side being the shorter one. The flag is repeated fourth field of the coat-of-arms of the County of Zagreb, that is five interchangably green and white horizontal fields with stright edges. In the middle of the flag is the coat-of-arms of the County of Zagreb, its heights being a hlaf of the flag shorter side. The original of the flag is held in the Office of the County Mayor. 4. in onther occasions, if the use is not against the provisions of this Decision. If the flag of the COunty is hoisted with the flag of the Republic of Croatia, the County flag comes to the left viewed from the street towards the flags.If the flag of the County is hoisted with the flag of the Republic of Croatia and the flag of a community or a city, the flag of the Republic of Croatia is in the middle, while the County flag is on the right viewed from the street towards the flags. This Decision is valid with the day it is issued in the Official gazett of the County of Zagreb. President of the County Assembly - dr. Zdravko Tomac, m.p. A rectangular flag edged with a fringe. On both sides the flag field had painted depictions at right angles to the flagstaff. Obverse: the crowned central part of the coat of arms of the Zagreb County granted by Maria Theresa on July 16th 1759. 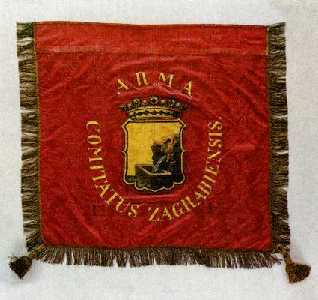 The inscription running around the coat of arms painted in gold reads: ARMA COMITATUS ZAGRABIENSIS ('The coat of arms of the Zagreb County'). 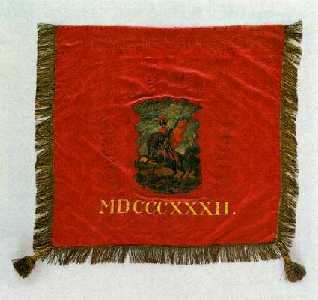 Reverse: in the centre of the flag field there is the iconographic depiction of St George slaying the dragon and the year MDCCCXII (1832) underneath it. J. Borosak-Marijanovic, Zastave kroz stoljeca, Zagreb, 1996, page 114. From Croatian History Museum site by courtesy of Jelena Borosak Marijanovic. This reveals that in May 2002 the community formed a commission to determine a proposal for the coat of arms and the flag. This means, I guess, that the community is still way from getting the symbols, but at least they made the first steps on that way. The coat of arms and flag are adopted. They are pictured and described in book: Stjepan Laljak ed. "Brdovecki zbornik", Matica Hrvatska, Zapreic, 2002. I have seen the book at the book fair (yesterday) and browsed though it, but I did not remember any details of the CoA design. The flag is blue with the coat of arms in the middle. Azure a tower argent between two liliy bushes. As far as I am aware, Ivanic-grad hasn't adopted official symbols but has a traditional coat of arms that is used occasionally (among others in touristic materials issued by the County, as well as on the County web-pages). For what I am aware, they are not used on flags. Gules a Mullet Or and a Crescent Argent. This is also used impalled with golden field picturing St. John. St. John, in Croatian Sv. Ivan is the namesake and patron of Zelina (this is how the city is usually named for short). As far as I am aware, Sveti Ivan Zelina hasn't adopted official symbols but has a traditional coat of arms that is used occasionally (among others in touristic materials issued by the County, as well as on the County web-pages). For what I am aware, they are not used on flags.